It is easy to panic when a baby's health is in question. The temptation is to go running to accident and emergency at the first sign of snuffles, but the truth is that children go through a number of changes while growing and most pick up a few illnesses along the way. Most of the time there is nothing to worry about, but a stay-at-home dad will have to make the judgement call and if at all unsure of what is causing the child's discomfort should consult a doctor. If crying more than usual, a baby could be trying to let dad know something is wrong. Any outward sign of discomfort, such as a graze, cut or bruise, makes it easier to identify the problem but an infection or virus can be harder to spot. There are certain potentially serious conditions that at househusband should be aware of and able to identify. Meningitis is an inflammation of the membranes that cover the brain and the spinal cord. There are two types and both can occur at any age. Bacterial meningitis can be life threatening and is more likely to affect children under five, while viral meningitis can be less serious and generally affects older children and adults. High-pitched moaning or whimpering cry. Fretful and not liking being handled. Neck retraction with arching of the back. Lethargic and difficult to wake. A rash of red or purple bruises or spots that don't fade when a glass is pressed against them. If a dad suspects a child has meningitis, he should go to accident and emergency immediately, as intravenous antibiotics need to be given as soon as possible. Early diagnosis can be difficult due to varying symptoms, but even an hour can make a difference so keep checking the child's symptoms. Bronchiolitis is a highly infectious respiratory infection passed on by coughing and sneezing, and is most common between November and March. It starts in the same way as a cold and symptoms include a mild cough, blocked or runny nose and shallow or rapid breathing. After two or three days, symptoms may get worse and include shallow or rapid breathing, rapid heartbeat, wheezing, persistent cough, fever and lack of interest in feeding. Parents should consult a GP if bronchiolitis is suspected or if cold symptoms have lasted longer than normal. Some babies with bronchiolitis need oxygen for a short period, and the baby should be taken to accident and emergency if coughing a lot, very breathless, more sleepy or less alert than usual, having difficulty feeding, developing more or new symptoms such as a wheeze or skin becomes pale or mottled. Anaphylactic shock is a severe allergic reaction that affects the whole body and usually happens within minutes of coming into contact with the allergen. It affects the respiratory and circulatory system, can raise blood pressure, cause swelling and breathing difficulties and can be life-threatening. Symptoms can include breathing difficulties, facial swelling, problems with swallowing, a blotchy rash all over the body, fainting and nausea and vomiting. Parents should dial 999 immediately, as the child will need emergency treatment with adrenaline. Febrile convulsions is a seizure that can occur in young children with a high temperature. They often happen at the start of an illness that has caused a rapidly rising temperature, but rarely last longer than a few minutes. Symptoms can be very frightening. The child will lose consciousness, limbs will go floppy or stiff and the child can stop breathing for around 30 seconds, causing skin to turn pale or blue. Limbs and muscles might twitch and eyes might roll upwards. Try to time the convulsion and put the child into the recovery position, lying on a side with their head level or slightly lower than their body. Loosen clothing and remove anything from the mouth. 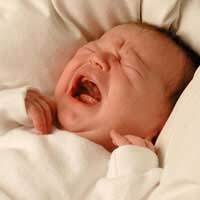 When the convulsion ends, use age-appropriate ibuprofen or paracetamol to lower the baby's temperature. If it is the first instance of febrile convulsion or if you are in any doubt, dial 999. By Dailing 999 the paramedics will take the child to hospital and are equipped to deal with any situation such as; a convulsion that lasts longer than five minutes, there is not a rapid improvement after the convulsion, the child has breathing difficulties or another convulsion starts soon after the first.